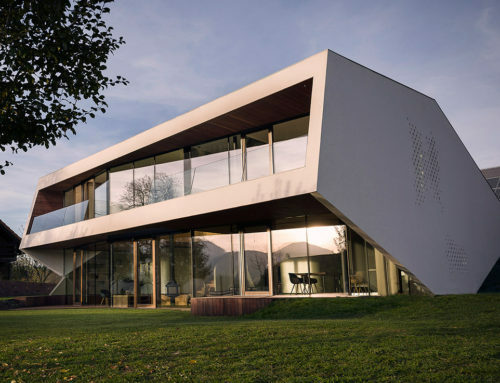 Family villa in Srbín was built on a spacious partially forested sloping plot with a small pond. 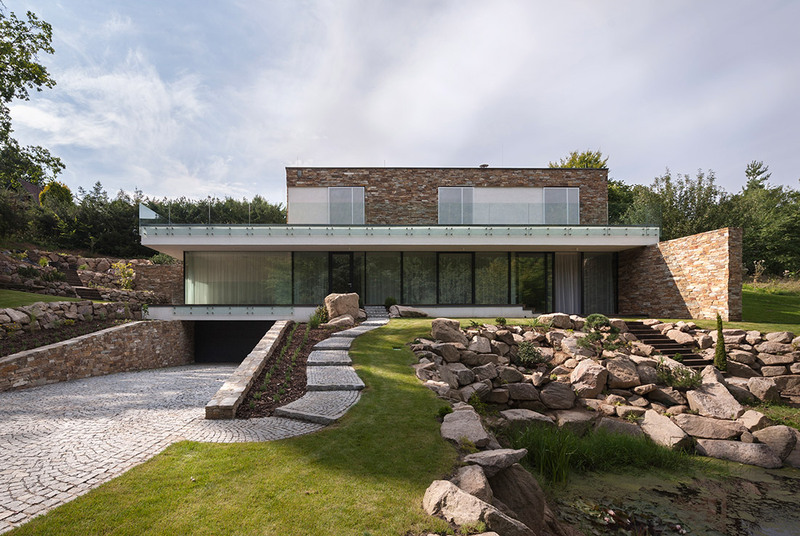 The aim of the design was to minimise the impact of the generous volume on the terrain and connect the house as much as possible with its surroundings by working with the relationship of the volume and the terrain, as well as by the choice of materials. Quarry stone of the same type as the stone found on the plot was used. 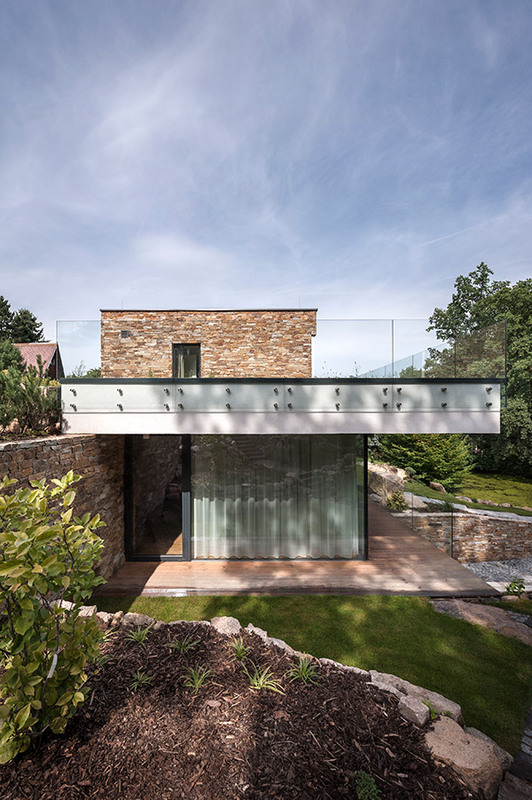 The house is composed of two basic volumes, the lower and larger one, which contains the “public” part of the building, being partially embedded in the sloping terrain and delimitated by stone-clad buttress walls which continue in the interior. 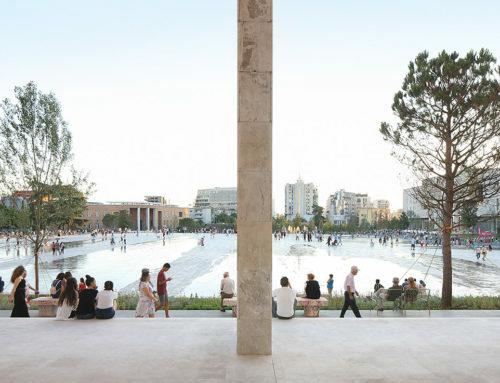 Its southeast front is fully glazed and open, allowing the interior to flow into the surrounding nature. The upper volume is considerably smaller and set back from the perimeter of the lower floor. It contains the private part of the house with a deck and roof garden continuing freely into the upper part of the garden. 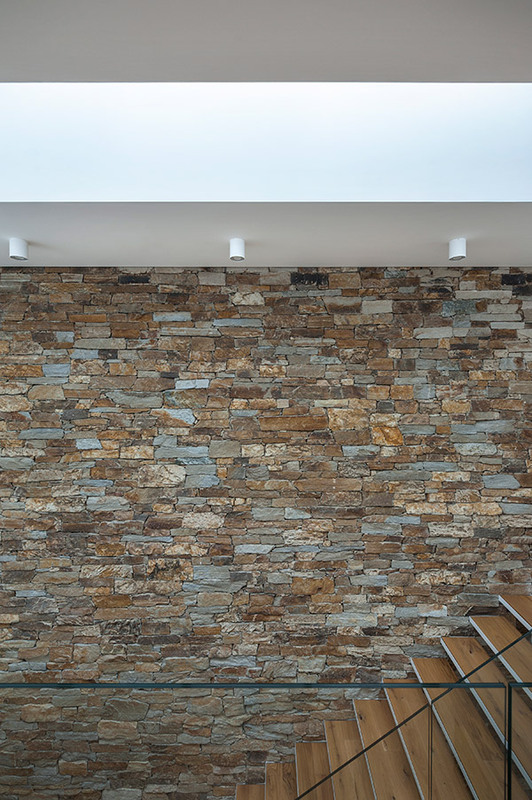 The neighbours perceive the whole house as a small single storey stone building. The large windows of the bedrooms are shaded by sliding perforated white steel shutters. 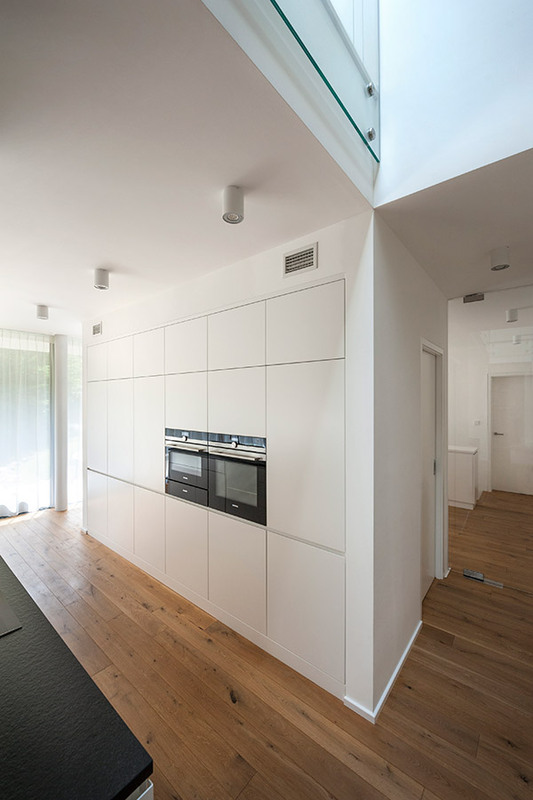 The interior of the public floor of the house is very open from the entrance hall to the living area and kitchen, the dining and relax zones having different heights and being separated by a double-sided fireplace block. The access to the private floor is via a cantilevered steel staircase with a skylight above. 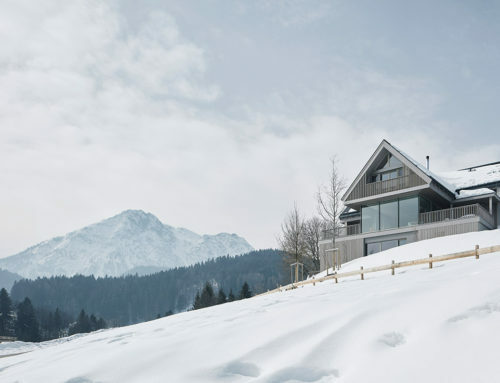 The house was designed as energy efficient, accentuating the usage of solar gains in winter. 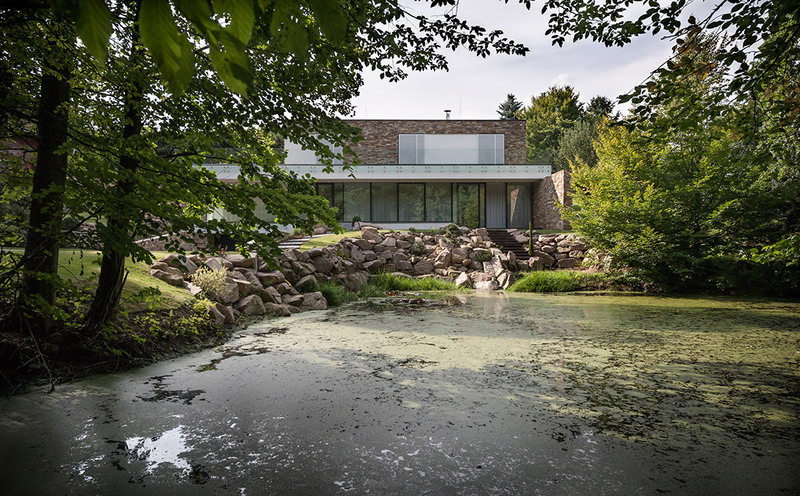 The aim was to minimise the impact of the generous house on the terrain and garden and to connect it as much as possible with the surroundings by working with the relationship of the volumes and the terrain, as well as the choice of materials. 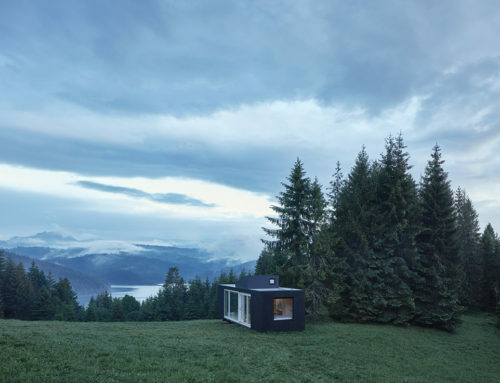 At the same time, life within the house should be allowed to flow freely into the surrounding nature and users to have undisturbed views of the pond and forest. 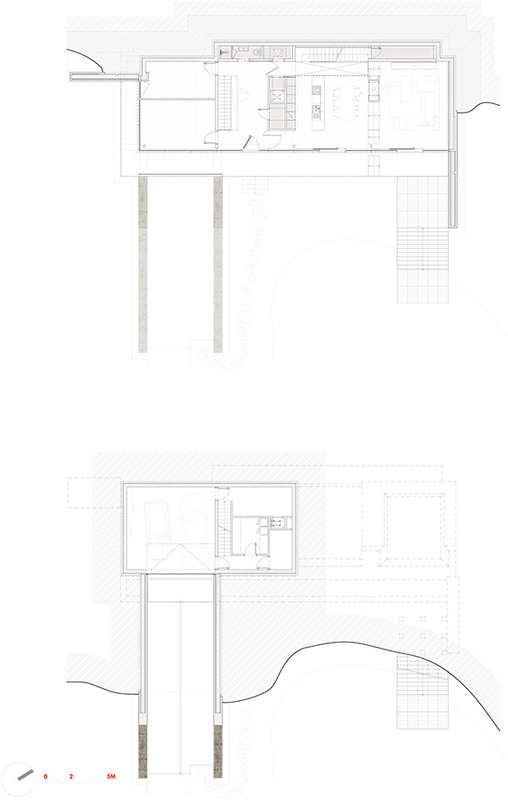 The layout of the interior was set out to be a clear and functional reflection of the volumetry: an open public level complemented by a more closed and compact. Private level above.